Hardwood and mixed forests. Dead and living hardwoods, especially elm. 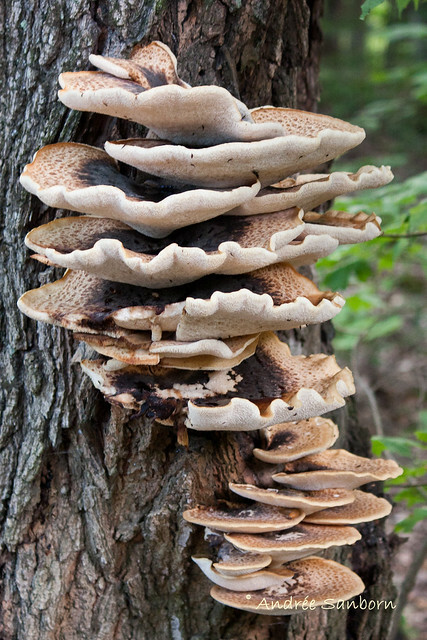 This is a common, easily recognized, wood decaying, bracket fungus. It fruits mostly in the spring but occasionally also in the summer or fall. It is found usually in overlapping clusters of 2 or 3, sometimes singly. It is both saprobic, occurring on logs and stumps of dead hardwood trees, and parasitic, occurring on the lower trunk of living hardwood trees, especially elms. The fruiting body is a large, stalked bracket. The bracket is circular to fan-shaped or kidney-shaped, 2¼″ to 12″ in diameter, and up to 1½″ thick. The upper surface is light yellowish-brown with flat, brown or dark brown scales. The scales have a feathery appearance, which accounts for the common names Hawk’s Wing and Pheasant’s Back. The underside is whitish. The pores are small at first, becoming very large, up to ⅜″ in the largest dimension. The stalk (stipe) is short, thick, tough, and often off-center. It is 1¼″ to 4″ long and ¾″ to 2¼″ in diameter. As it ages the base of the stipe becomes velvety black. The spores are whitish to cream-colored. Un champignon trouvé sur une souche dans le jardin. Polyporus squamosus is a spring time wild edible mushroom that is found in the same habitat and at the same time of year as morel mushrooms here in Southern Michigan. Awesome example of large tree fungus on a sycamore tree. Name is Dryad's Saddle (Polyporus squamosus) and it is edible when younger. Thanks to 'grifola' for that information. I found mushrooms today, I was pretty sure they were Pheasantback or Dryad's saddle but wasn't 100% sure till I put this video up so I didn't bring them home, my research says you should always pick them small, large ones are rubbery! and they have a faint smell of watermellon. De zadelzwam (Polyporus squamosus) is een paddenstoel uit de familie Polyporaceae. Gefilmd in natuurgebied de Uithofpolder Den Haag (t.o. Het Wenpad, Poeldijk).